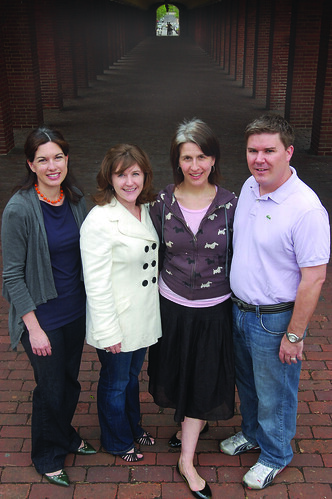 Spells Writing Center organizers (from left) Caroline Tiger, Jill Schiller, Sacha Adorno and Jared Von Arx stand at Head House Square, where they hope to open the center (Julia Wilkinson/TTN). A motley group of writers, lawyers, illustrators, students and other professionals recently met in a Center City home to discuss plans for a new community outreach project. Wiz-Mart, the Original (But Not the Olde) Philadelphia Wizards’ Supply Store, hopes to be Philadelphia’s must-stop shop for Wizards living in and around the city. All necessities will be covered: bargain bins of wizard caps, cauldrons and wands for all mystical ages. For the wizard on the go, Wiz-Mart will offer pre-bottled spells and potions. And for the neighborhood kids, it will teach them how to write. Spells, the formal name of the nonprofit organization, is a tutoring center that aims to help students aged 6 to 18 learn how to become better writers. The center was inspired by the model established by Dave Eggers’ 826 Valencia, the original national nonprofit organization comprised of writing centers dedicated to getting local volunteers to spend one-on-one time with kids in need, which is now known nationwide as 826 National. Each of the seven writing centers has a specific theme with an accompanying storefront: a pirate supply shop at the Valencia store in San Francisco, a superhero outfitters market in Brooklyn, N.Y., and a robot repair shop in Michigan. In Philadelphia, Wiz-Mart will help Spells follow the same basic premise established by National – and pay the rent, too. “Right now, fundraising is our major focus,” said Jill Schiller, Spells’ executive director. The group plans to have the storefront open by Fall 2010. With programming, the Wiz-Mart founders estimate a cost of $400,000 – necessary for a full opening for students. “We have people with the expertise saying this is possible,” Schiller said. The future of Spells relies on the abilities of its five founders. Schiller is a Philadelphia attorney with a background in creative writing. The organization’s resident author, Tiger, is a freelance writer who has published books and articles in a variety of publications. Josh Freely received his doctorate from Temple and currently works as a senior research associate and director of labor market research for Public/Private Ventures. The group has child psychologist Jared Von Arx, and the final member of the team, Sacha Adorno, is a nonprofit marketing specialist who has authored marketing plans with various organizations. The team is still trying to fill its educator position. The group is encouraging students from local colleges to get involved, offering internships for credit. Although Spells is not affiliated or involved with any of the seven 826 National organizations across the country, founders hope to receive accreditation when 826 begins accepting applications in the upcoming months. Spells has already formed an online presence. The organization has an e-mail list of more than 100 names, a Twitter account and a Facebook page. Its new blog, phillyspells.org, launched April 27. For now, Wiz-Mart will continue planning and fundraising. The organization also hopes to find a spot on South Street to hang its wizard hats. Jonathan Viguers can be reaches at jviguers@temple.edu. Blog run by college grads unleashes the geek in us.